Hooray! 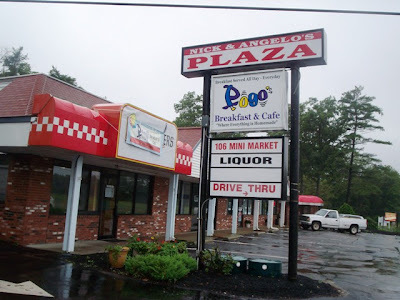 Pogo's, formerly Pogo's II, is now back at their original location on Route 106 inside Nick & Angelo's Plaza. The new phone number is (508) 697-0008, although they never answer the phone (a machine always picks up). When Mom and I stopped by on Saturday, August 29, around 5 p.m., we heard someone shout "We're closed!" from the parking lot. Can't a person just stop by to check the hours? Speaking of which, the hours are 6 a.m. to 3 p.m. Monday through Saturday, and 7 a.m. to 2 p.m. on Sunday. Both Mom and I can't wait to pay them a visit. I just hope that we're not yelled at again. Not fun. UPDATE (8/28/07): Since Mom and I were so in love with this place on our first visit, we decided to take the drive to Halifax to have another fabulous breakfast. We were not disappointed. Mom chose to have the Eggs Dublin Benny ($8.99) which consisted of two eggs covered in Hollandaise sauce sitting atop a pile of corned beef hash and an English muffin. I had the hubcap-sized blueberry cheesecake pancakes ($8) and ended up taking half of them home. They were that big. I also, thinking that I might need some protein, ordered a side of five slices of bacon ($1.99). When ten slices showed up on the plate, Mom and I were pleasantly surprised. Everything (even the coffee) was fabulously delicious, and the total came to $22.15. Our waitress, Kimmy, was excellent, and we were proud to see that Pogo's actually framed our review certificate (we send one to every place we visit). We love this place, and would recommend it to anyone looking for a unique and outstanding breakfast. One of the best, if not the best, breakfasts I've had in my entire life. Mom came across this Phantom Gourmet "Hidden Jewel" one day while cruising her favorite food Web sites. Pogos boasts that they have a very unique and delicious breakfast selection that marries ordinary morning foods like pancakes and French toast with delicious desserts such as cheesecake and tiramisu. We just had to see this for ourselves! Although a little difficult to find (thanks, MapQuest), Pogos is right on the Halifax/Hanson line. It is definitely not on a main street, but the street that it's on (Monponsett) is just to the right of a huge Stop & Shop on Plymouth Street, and hopefully with this information you won't have the same "experiences" that we did trying to locate Pogos. When Mom and I pulled into the parking lot around 11:30 a.m., the first thing we noticed is that the outside is nothing special. Once we walked in, although it looks inviting and resembles a bigger than average country kitchen, it just didn't look like the place where you would find gourmet breakfast food. Our waitress, Terry, showed us to a newly empty booth toward the back of the restaurant. We just loved these booths. The black pleather seats looked like something out of an old Buick. They were very roomy and comfortable. She poured coffee for my mother and chatted with her about how busy it had been earlier in the morning. She offered me hot coffee, but I decided to have an iced one instead. Terry went off to retrieve my iced coffee, but quickly returned with two menus that were encased in three-ring binders. The Phantom Gourmet logo is on the front, as is the mention about their "Hidden Jewel" status. The menu is very extensive. All the pages are kept safe and clean in page protectors, and the first printed page you will see is the history, or in this case herstory, of Pogos. When we got to the descriptions of the dishes, it was like nothing we'd ever seen before. One of the first dishes I read about was the blueberry cheescake pancakes. They are made with real blueberries and fresh cheesecake pieces. Sounds delicious! They also have pumpkin n' spice, pina colada, chocolate chip, banana nut, and many other pancake variations. The little notation above the different choices brags that the pancakes are "as big as hubcaps," although you can always order a short stack just in case hubcaps are too much for you. There is also a note that they can top your pancakes with some added fruit or nuts - whatever you choose. They also have tiramisu French toast, specialty waffles, French toast made with Portuguese sweet bread, and many assortments of eggs Benedict, which is rare in itself as most places only serve one version. There is a children's menu available, and a large selection of omelets with names like The Greek Goddess (Greek style) and The Portuguese Princess (made with chourico or linguica). If you can think of it, they'll make an omelet out of it just for you. Pogos is also famous for their corned beef hash, and this tasty favorite can also be made into an omelet with a side of some of their specialty breads like the chocolate, banana, or pumpkin - all made on the premises. They have the standard one, two, and three egg dishes served with your choice of meats (bacon, maple sausage, linguica, chourico, etc. ), home fries, and toasts. They have specials ranging from $5.99-7.99, and they also have a small stand at the entrance that has baskets filled with homemade muffins, pies, and other goodies for sale. Although they are only open until 2 p.m., Pogos does serve lunch. However, we were here for the main event - breakfast. When Terry returned to our table to take our order, I reminded her that she never brought me my iced coffee. She laughed and told me that she did pour it, but had misplaced it and promised to track it down right away. Mom went with the deliciously described tiramisu French toast ($8) while I chose the pumpkin n' spice pancakes short stack ($3.99). Terry left the table but quickly returned with my iced coffee, which was very tasty as was Mom's hot version. The interior is very cute. There are hanging country plates, flowered curtains, painted yellow walls, and a long wooden bar with many stools where you could watch the two overhead TV sets. There are a handful of booths, but they were outnumbered by the tables that were set up in the middle of the dining area. There were no tablecloths, but the tables were decorated with the standard place mat with local area businesses. The servers seemed very friendly and there was a very young busboy that was lightening-fast when cleaning up after a table had cleared. Everything was very neat, clean, and cozy. It did not take very long for our food to arrive, but when it did, Mom and I could not stop smiling. Mom's tiramisu French toast looked like a specialty dessert in a gourmet magazine. Served on an adorable square plate, the dish was made up of four slices of chocolate bread that had been transformed into French toast. Mom said that the bread had a distinct brownie taste. Sandwiched between each slice was a layer of Mascarpone cheese with chocolate syrup drizzled over the top. Little swirls of real whipped cream, mini chocolate chips, a whole strawberry, and kiwi pieces topped the dish. A masterpiece, and the best part was, it tasted just as good as it looked - amazing. You could smell my pumpkin n' spice pancakes before they arrived at the table. There were three thick pancakes topped with a dollop of real whipped cream and butter. Once I stacked them all on top of each other, I dug in. Absolutely fabulous. The inside was moist and filled with the delicious pumpkin flavor. They were served hot, but even temperature couldn't stop me from devouring my breakfast. It was out of this world. I left $18 for Terry and the bill (including 20% tip). She was an excellent waitress and told us of how much she enjoys the pumpkin n' spice pancakes. She even mentioned that the chef made her a special pumpkin n' spice waffle once and it was such a hit that they put it on their "specials" menu. Mom and I left and vowed to return to our new favorite breakfast place. This is certainly more than a "Hidden Jewel," it is a hidden treasure. Pogos II is open from 6 a.m. to 2 p.m., Monday through Saturday, and 7 a.m. to 1 p.m. on Sunday. We were lucky to get in and seated right away, as we've heard that on weekends the end of the line is found out in the parking lot.